ALPHARETTA, Ga., May 7, 2013 – Maxim Surgical, a new designer and manufacturer of spinal implants, has received 510(k) clearance from the U.S. Food & Drug Administration (FDA) for its new MaxFuse-C™ cervical interbody fusion system made of Zeniva® polyetheretherketone (PEEK) rods from Solvay Specialty Polymers. Zeniva® PEEK – part of Solvay’s line of Solviva® Biomaterials – has a modulus very close to that of bone plus excellent toughness and fatigue resistance. The FDA clearance was based in part on Solvay’s well-developed master access file for Zeniva® PEEK. The cervical interbody fusion system made from Zeniva® PEEK rod is hollow so that bone can grow through the device, fusing the adjacent bony surfaces of the vertebrae. The cervical spacer for the spinal fusion market is Maxim’s first orthopedic implant.Zeniva® PEEK offers numerous advantages over metals such as titanium for spinal implants. The material offers many important benefits including biocompatibility, chemical inertness, and a modulus of elasticity that is close to that of bone. Based on biocompatibility testing, Zeniva® PEEK demonstrates no evidence of cytotoxicity, sensitization, irritation, or acute systemic toxicity, and meets the ASTM F2026 standard. It also boasts high strength and stiffness and has radiolucent properties which enable x-ray procedures without interference.The MaxFuse-C™ cervical interbody fusion system is machined from 16-mm and 20-mm diameter Zeniva® PEEK rods. 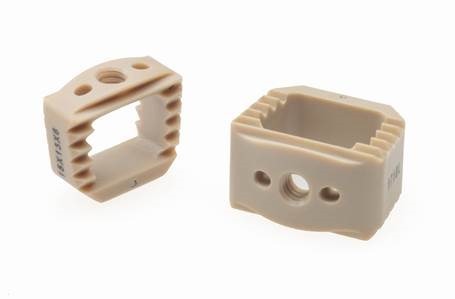 It is available in two footprints – 15-mm x 13-mm and 17-mm x 14-mm in both neutral and six degree lordotic options – offering surgeons flexibility in meeting different patient anatomies. The system also provides a large graft window which facilitates a bigger graft volume for fusion. Maxim offers an easy-to-use single tray system which includes simplified instrumentation for all of their available implant options. Maxim plans to explore the future use of Zeniva® PEEK in a range of other spinal fusion products. In addition to Zeniva® PEEK, Solvay’s Solviva® Biomaterials line includes Veriva® polyphenylsulfone (PPSU), which provides unsurpassed toughness combined with transparency and excellent chemical resistance; Eviva® polysulfone (PSU), which offers toughness in a strong, transparent polymer; and Proniva® self-reinforced polyphenylene (SRP), one of the world’s stiffest and strongest unreinforced thermoplastics that offers exceptional chemical resistance and hardness. These sterilizable products are available in injection molding and extrusion grades as well as rods and plates for machined components. For more information about Maxim Surgical: www.maximsurgical.com.and Solvay’s Zeniva:www.solvayspecialtypolymers.com.